I wish everyone a great weekend. Thank you for reading! I love this Topshop skirt so much. The color screams fall, and pairing it with the OTKB was perfect! Glad to hear you're feeling a little better too! SO in love with this whole look! I've been eying that skirt and now I'm convinced it's a must. I am glad you are feeling better! This outfit is so cute and I love the girly vibes. I might need to copy this look with my skirt to get a little more wear out of it! I love it with the OTK boots, and how great are bow blouses right now?! Glad you are back to feeling better. Glad you feel better first of all. I own 3 real suede skirts but would love a camel one like yours. Your skirt and the whole 70s appeal is great. It would look awesome with an oversized sweater too. Thanks fir the linkup beautiful. I'm glad you are feeling better! I love the color of this suede skirt and how this piece looks with the OTK boots! I'm looking forward to the winter outfit you will create with this skirt. Have a great weekend! Thanks for stopping by my blog! I would say you are doing excellently on your blog photos. They all look very clean and polished. Thanks for inviting me to link up! Gorgeous outfit! Happy to hear you're feeling better!! I love the 70s vibe of this look, that suede skirt is fantastic! Wow! I have the same skirt and I haven't worn it in a while. I love the way you styled it for fall. I think I need to break mine back out and give try another look as well. I'm so glad your are starting to feel better and so impressed with how you were able to still get all your posts out. Have a great weekend! I love this look! 60s mod with 70s. Perfect! You're gorgeous! I'm so in love with your skirt and boots! That skirt and those boots!!! So in love!!! I'm obsessed with this look! That skirt is fab! I love this look! 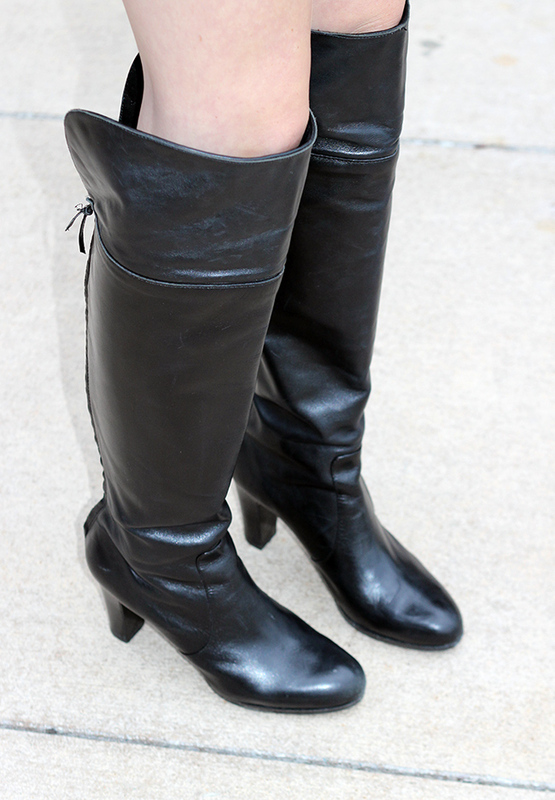 You look amazing in these knee high boots! Totally in love with your skirt, so chic! Beautiful Rachel, I just wanted to let you know that I featured this outfit in my blog in my current post. I super loved this outfit! In love with your bow top! Loving this look and the rich color combination! This outfit is fabulous. Love this look! That skirt is so cool and it looks perfect with the tie blouse! Beautiful! Love the suede skirt & OTK boots! What an awesome outfit! I love the black and camel together, and that skirt is super cute. This skirt is s fab!! I have been toying with a suede skirt myself. I love them this fall especially yours - my fave color choice. Thanks so much for linking up with us this week. Hope to see you back again. Have a lovely week! I have a suede skirt that I am looking forward to wearing & I will be taking outfit inspiration from you! Love the way you styled this look.